If she really wants to go, let her fly on her broom !! I feel like I am back in college watching two fraternities play power games and practical jokes on each other. LOL but it was a nice move. LOL but it was a nice move. I agree with Buckeroo. Good comment. You're not as bad as I make you out to be sometimes. Pelosi's staff has allegedly been "berating" military officials to get the best planes possibly for the speaker to fly across country, according to e- mails obtained by the government watchdog group Judicial Watch (you can read all the emails on their site) and first reported by The New York Post. "It is my understanding there are no G-5s available for the House during the Memorial Day recess. This is totally unacceptable . . . The speaker will want to know where the planes are," a Pelosi aide wrote in one of the e- mails to the military. Pelosi's bus to nowhere. They don't have any gov money to pay the fare, so they can't get off? 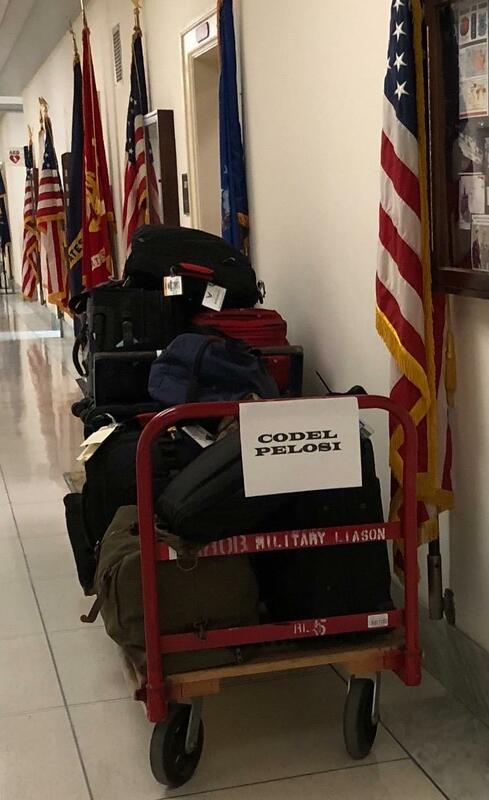 Trump sent Pelosi's luggage back.